Woven using the same designs as Serenade Crème, “Serenade rouge” features the same rich detailing as its counterpart, only in a red. 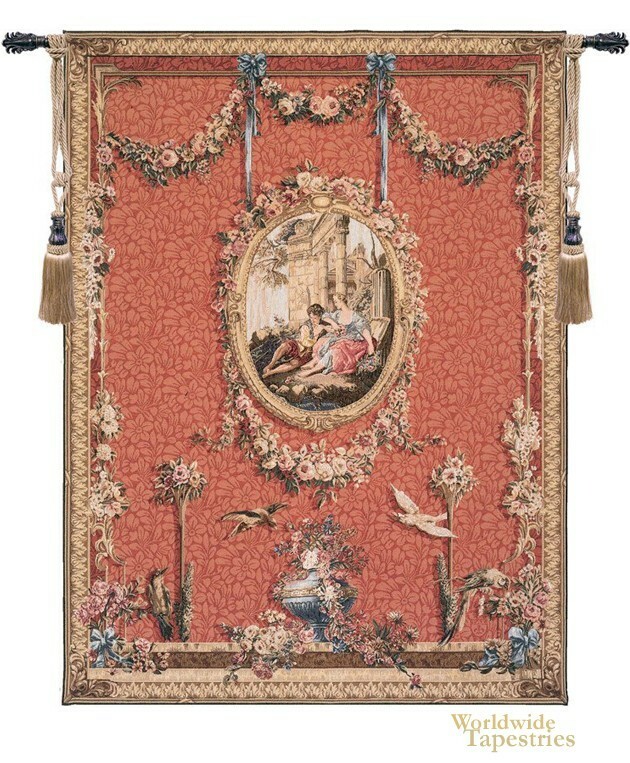 Part of a set of tapestries produced by the Gobelin’s Manufacture at the very end of the 18th century, this tapestry features a young couple in love in the center medallion. The scene is inspired by the work of Francois Boucher, who served as court painter under Louis XV. His love of landscapes and romance were the subject of many of his rococo style tapestries. While the flora and fauna of the Serenade Crème is more muted, they really jump out of the reddish background of “Serenade rouge”. This tapestry is lined and has a tunnel for easy hanging. Note: tapestry rod and tassels, where pictured, are purchased separately.